She has achieved that dream, and she is now the traffic reporter on Hawaii News Now Sunrise. Before she was a news reporter, Deniz was a student at Hawai‘i Community College’s (Hawai‘i CC) campus in West Hawai‘i, which was formerly in Kealakekua. She earned her Associate of Arts in Liberal Arts degree, graduating in 2012. She then transferred to the University of Hawai‘i at Mānoa where she earned a bachelor’s degree in journalism and communications. The Hawai‘i Community College Alumni & Friends organization announced in February that Deniz is the recipient of the 2018 Alumni of the Year Award for the Hawai‘i CC campus. She was honored during an event last month at the Manono campus in Hilo. She will also be the keynote speaker at the commencement ceremonies at the Hawai‘i Community College – Pālamanui campus in Kona on May 12, 2018. During the 5th Annual Hawai‘i Community College Day event on February 8, Deniz participated in a panel discussion and answered questions from middle and high school students about how to succeed in college. Deniz credits her experience at Hawai‘i CC and the support she received at the college with helping her secure an internship at Hawaii News Now that launched her career in journalism. Lacy was crowned Miss Kona Coffee in 2011, and then participated in the Miss Hawaii pageant. She describes hula as one of the main passions in her life, and recently she participated with her halau in the Merrie Monarch Festival Competition. When she’s not in the studio, Deniz loves spending time outdoors hiking, horseback riding and paddling. The Hawai‘i CC Alumni of the Year Award was established in 2017 and recognizes the success and achievements of Hawai‘i CC alumni. 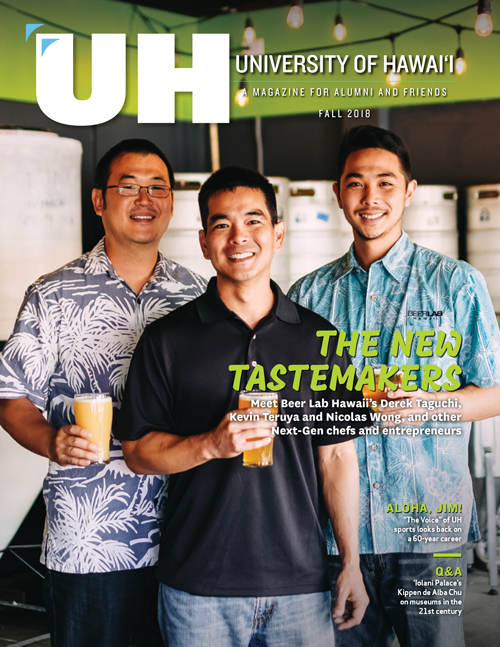 The award increases awareness of the positive outcomes of the college, builds alumni pride, and creates stronger connections back to Hawai‘i CC. Recipients are honored at campus events and celebrated during the course of the academic year. 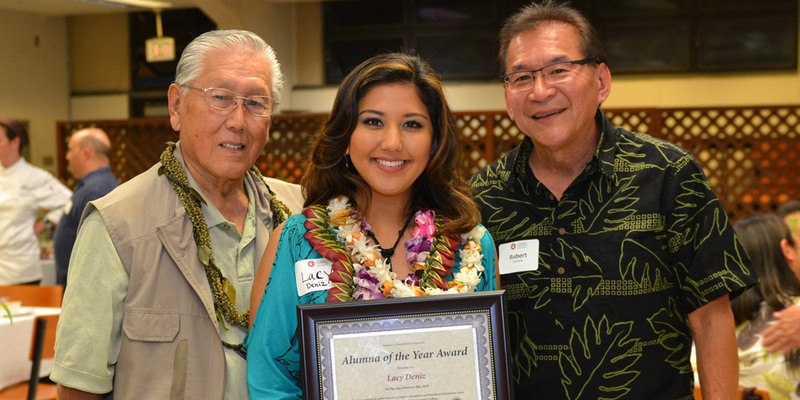 Photo caption: Hawai'i Community College 2018 Alumni of the Year Award recipient Lacy Deniz, center, was honored during a Hawai'i CC Alumni & Friends event in February. At right is Hawai'i CC Alumni & Friends President Bobby Yamane, and at left is Harold Nishimura, who received the Hawai'i Community College 2017 Alumni of the Year Award.